The first product? 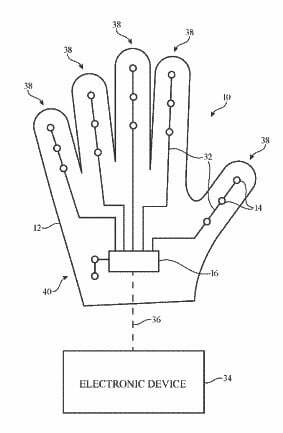 A patent for a glove. After some Apple patents made the news last November for foldable smartphones, now the company led by Tim Cook has applied for other patents, these ones related to smart clothing. In fact, Apple was recently granted several U.S. patents related to the concept of a “force-sensing glove” – sadly, though, not a Star Wars reference, as the glove seems to be more geared towards health monitoring. The idea is to weave circuitry sensible to pressure and force into fabrics, with capabilities to then transmit data to an external device, like a smartphone, tablet, computer, or even a wearable device. Clearly mentioned in the patent is the fact that a glove is just an example of a clothing item in which the technology could be applied – Apple mentions that any other similar item would be able to integrate with this kind of circuitry, as it would be placed in between the strands of fabric. As it usually happens with patents, this one is really not specific at all in terms of the purpose of the technology, so we are left wondering about what the point of such a device is. Still, one section of Apple’s patent does refer that this force sensing technology could be used to measure vital signs, such as heart rate, blood pressure, respiration, and more. With this in mind, and even though the specific applications are yet unknown, it is safe to assume that smart clothing will be a trend in the future. If Apple’s interest in this field is not enough to convince you of this, then you should definitely check out the work of scientists at Britain’s Nottingham Trent University. The team there is working to create garments with embedded solar cells, which actually make it possible to, for example, charge your smartphone. What do you think of this patent from Apple and smart clothing in general? Let us know down below in the comments or carry the discussion over to our Twitter or Facebook.